Looking for Axis Bank company jobs? 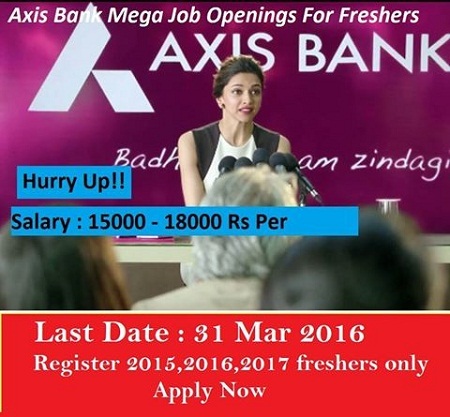 Axis bank has announced huge openings for freshers and experienced candidates. Want to apply for it? Now check it below. Axis Bank Limited is the third largest private sector bank in India. Axis Bank's stake holders include prominent national and international entities. As of 31 Dec. 2013, approximately 43% of the shares are owned by Foreign Institutional Investors. computer operating work on excel .basic knowledge of computer compulsary.